Jester - are you talking about cross section, or cross section per nucleon? The cross section per nucleon for a Z-boson is I think around 10^-39 (see Essig 0710.1668 eq 1) and for a Higgs boson I think it's more like 10^-45 (ish) see e.g., Davoudiasl et al 0405097 fig 2. So I think the region we're about to get into is the Higgs mediated region. Of course there's always the possibility that we are living in a region of low dark matter density inside the halo. This is always a possibility to revive your favorite weak scale dark matter model. The poor zombie stringy susy just keeps on going regardless, heh? 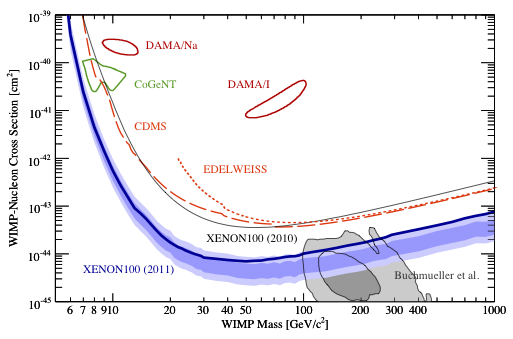 What we need now is a susy reduction combination plot for multiple experiments: LHC, Xenon, etc. "It is statistically improbable for us to be in a region of abnormally"
Maybe the dark halo is very different to the standard one. See http://arxiv.org/abs/1103.6091: a WIMP with mass in the TeV range and a rotating dark disk could be a viable solution for DAMA and the recoils measured by the other experiments. @NW: Concerning the Higgs exchange, for example hep-ph/0011335 quotes σ ~(DM-Higgs coupling)^2*(120 GeV/mh)^4*(100 GeV/mDM)^2*10^-42cm2 . 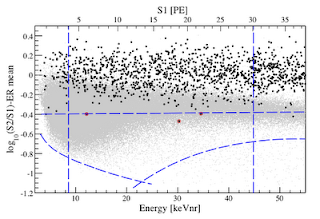 Davoudiasl et al must be using a smaller coupling, but I can't figure out what exactly they put in. Kea, do you include my version of susy between the zoombie stringy ones? Alejandro, only if you predict zombie superpartners. Hi Jester - I think Davoudiasl is consistent with 0011335. 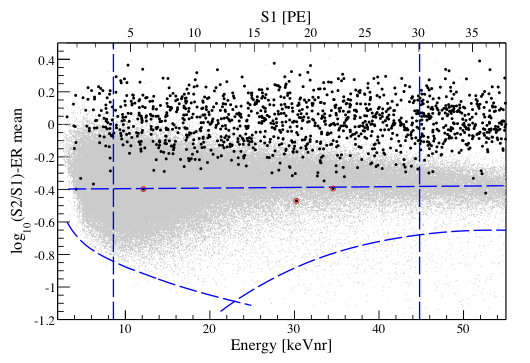 Note that if you look at the plots, the characteristic cross section when normalizing relic abundance is typically ~10^-45 or a bit lower for heavier WIMPs and MH=O(120). But, I agree, it's a funny way of writing the cross section because the coupling is characteristically smaller than O(1) to DM. The way I think about it (which is certainly a feeble approximation) is that Z's have O(1) couplings to matter, while the effective Higgs Yukawa is ~1/3 x mp/v ~ 10^-3 (where the 1/3 is uncertain and comes from people who know how to calculate such things). So if Z's give ~10^-39, I expect Higgses to give (10^-3)^2 x 10^-39 ~ 10^-45. That's obviously super hand-wavy but from my perspective we're just now getting into what I think of as the rich part of the "Higgs-mediated" region for thermal WIMPs.